Although the masses and most of the financial media blame hedge funds for their exorbitant fee structure and disappointing performance, these investors have proved to have great stock picking abilities over the years (that’s why their assets under management continue to swell). We believe hedge fund sentiment should serve as a crucial tool of an individual investor’s stock selection process, as it may offer great insights of how the brightest minds of the finance industry feel about specific stocks. After all, these people have access to smartest analysts and expensive data/information sources that individual investors can’t match. So should one consider investing in Tiffany & Co. (NYSE:TIF)? The smart money sentiment can provide an answer to this question. Hedge fund interest in Tiffany & Co. (NYSE:TIF) shares was flat at the end of last quarter. This is usually a negative indicator. The level and the change in hedge fund popularity aren’t the only variables you need to analyze to decipher hedge funds’ perspectives. A stock may witness a boost in popularity but it may still be less popular than similarly priced stocks. That’s why at the end of this article we will examine companies such as Banco de Chile (NYSE:BCH), Msci Inc (NYSE:MSCI), and ANSYS, Inc. (NASDAQ:ANSS) to gather more data points. The American luxury jewelry and specialty retailer experienced a sharp drop in its stock on Wednesday after issuing its earnings report for the third quarter. During the quarter, the company logged revenue of $1.01 billion, a year-over-year increase over the $976.20 million reported in the year-ago period, but below analysts’ revenue estimate of $1.05 billion for the period. Tiffany & Co reported earnings per share of 77 cents for the quarter, down from 80 cents last year. Net earnings came in at $94.90 million, a drop from the company’s net earnings of $100.20 million reported in the third quarter of 2017. The company also did not take any chances with its outlook, preferring to reaffirm its EPS within the range of $4.65 to $4.80 for the year, with Wall Street expecting something a little more meatier. TIF stock dropped 11% as of Wednesday morning. It’s important to note that Francesco Trapani, a director at the company, off-loaded 10,000 shares at $123.80 apiece in September. It proved a wise move, with the company’s shares tumbling to $92.54, as of Nov. 28 market close. According to most market participants, hedge funds are assumed to be unimportant, outdated financial tools of yesteryear. While there are more than 8000 funds in operation at present, Our experts look at the leaders of this club, around 700 funds. These investment experts handle bulk of the hedge fund industry’s total asset base, and by following their unrivaled picks, Insider Monkey has unsheathed a few investment strategies that have historically outrun Mr. Market. Insider Monkey’s flagship hedge fund strategy exceeded the S&P 500 index by 6 percentage points per annum since its inception in May 2014 through early November 2018. We were able to generate large returns even by identifying short candidates. Our portfolio of short stocks lost 26.1% since February 2017 even though the market was up nearly 19% during the same period. We just shared a list of 11 short targets in our latest quarterly update. Let’s check out the new hedge fund action regarding Tiffany & Co. (NYSE:TIF). Heading into the fourth quarter of 2018, a total of 43 of the hedge funds tracked by Insider Monkey held long positions in this stock, a change of 0% from one quarter earlier. 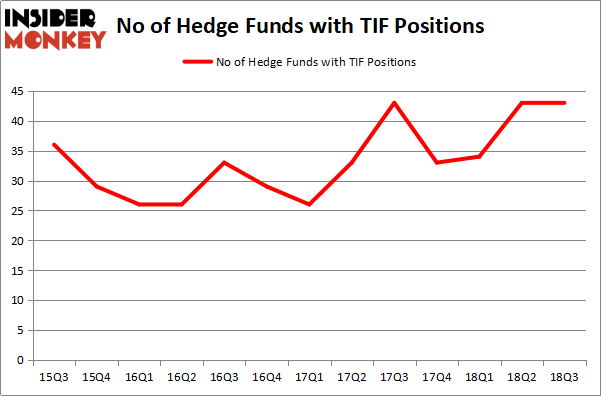 On the other hand, there were a total of 33 hedge funds with a bullish position in TIF at the beginning of this year. So, let’s examine which hedge funds were among the top holders of the stock and which hedge funds were making big moves. 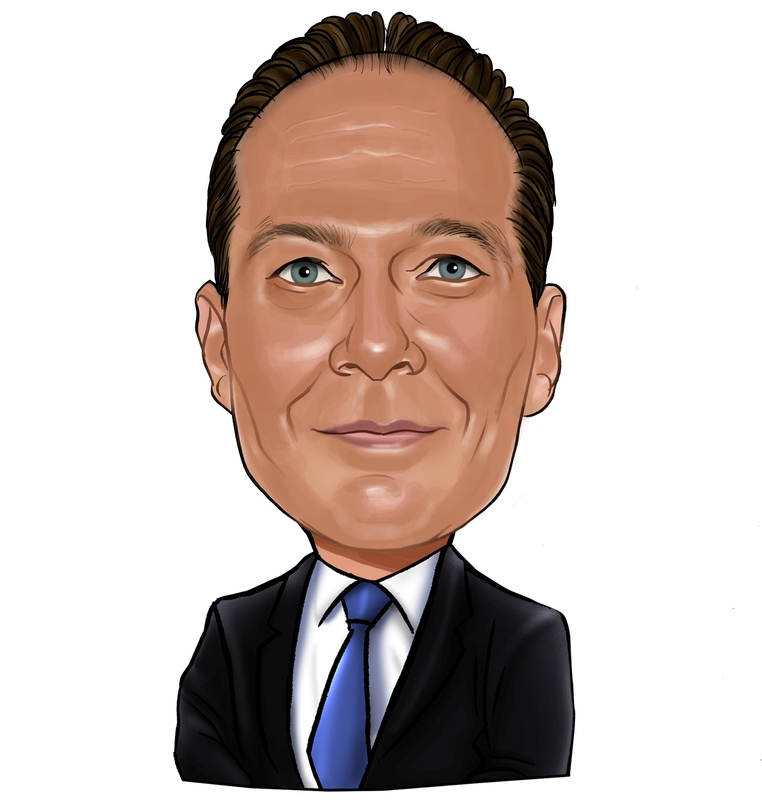 According to publicly available hedge fund and institutional investor holdings data compiled by Insider Monkey, Barry Rosenstein’s JANA Partners has the largest position in Tiffany & Co. (NYSE:TIF), worth close to $146.2 million, comprising 4.4% of its total 13F portfolio. Sitting at the No. 2 spot is Adage Capital Management, managed by Phill Gross and Robert Atchinson, which holds a $139.7 million position; the fund has 0.3% of its 13F portfolio invested in the stock. Other professional money managers with similar optimism contain Jacob Doft’s Highline Capital Management, Ken Griffin’s Citadel Investment Group and Ryan Frick and Oliver Evans’s Dorsal Capital Management. Due to the fact that Tiffany & Co. (NYSE:TIF) has experienced falling interest from hedge fund managers, it’s safe to say that there is a sect of fund managers that decided to sell off their entire stakes in the third quarter. At the top of the heap, Steve Cohen’s Point72 Asset Management sold off the biggest position of the “upper crust” of funds watched by Insider Monkey, totaling an estimated $18.8 million in stock. Ernest Chow and Jonathan Howe’s fund, Sensato Capital Management, also cut its stock, about $16.2 million worth. These transactions are important to note, as aggregate hedge fund interest stayed the same (this is a bearish signal in our experience). Let’s go over hedge fund activity in other stocks – not necessarily in the same industry as Tiffany & Co. (NYSE:TIF) but similarly valued. These stocks are Banco de Chile (NYSE:BCH), Msci Inc (NYSE:MSCI), ANSYS, Inc. (NASDAQ:ANSS), and Veeva Systems Inc (NYSE:VEEV). This group of stocks’ market valuations resemble TIF’s market valuation. As you can see these stocks had an average of 23.75 hedge funds with bullish positions and the average amount invested in these stocks was $497 million. That figure was $1696 million in TIF’s case. Msci Inc (NYSE:MSCI) is the most popular stock in this table. On the other hand Banco de Chile (NYSE:BCH) is the least popular one with only 2 bullish hedge fund positions. Compared to these stocks Tiffany & Co. (NYSE:TIF) is more popular among hedge funds. Considering that hedge funds are fond of this stock in relation to its market cap peers, it may be a good idea to analyze it in detail and potentially include it in your portfolio.